Birsa Munda (1875–1900) was a tribal leader and a folk hero, belonging to the Munda tribe who was behind the Millenarian movement that rose in the tribal belt of modern day Bihar, and Jharkhand during the British Raj, in the late 19th century making him an important figure in the history of the Indian independence movement. Birsa Munda is named with great respect as one of the freedom fighters in the Indian struggle for independence against British colonialism. His achievements in the freedom struggle became even greater considering he accomplished this before his 25th year. Birsa’s devotion to his people was such that he was almost revered as God by his followers. By the time he was in his 20s, his activities in the tribal areas of Jharkhand state (earlier Bihar) had already begun to worry the British establishment to a considerable extent. He was finally caught by the British on 3 February 1900 when he was only 25 years old. He died soon afterwards under mysterious circumstances on 9 June 1900 in Ranchi Jail. Birsa Munda was born on 15 November in the year 1875 on a Thursday, and he was named after the day of his birth according to the then prevalent Munda custom. The folk songs reflect popular confusion and refer to both Ulihatu and Chalkad as his birth-place. Ulihatu was the birth-place of Sugana Munda, father of Birsa. The claim of Ulihatu rests on Birsa’s elder brother Komta Munda living in the village and on his house which still exists albeit in a dilapidated condition. Birsa’s father, mother Karmi Hatu, and younger brother, Pasna Munda, left Ulihatu and proceeded to Kurumbda near Birbanki in search of employment as labourers or crop-sharers (sajhadar) or ryots. At Kurmbda Birsa’s elder brother, Komta, and his sister, Daskir, were born . From there the family moved to Bamba where Birsa’s elder sister Champa was born followed by himself. Soon after Birsa’s birth, his family left Bamba. A quarrel between the Mundas and their ryots in which his father was involved as a witness was the immediate reason for proceeding to Chalkad, Sugana’s mother’s village, where they were granted refuge by Bir Singh , the Munda of the village. Birsa’s birth ceremony was performed at Chalkad. Birsa Munda had a very nice and joyful childhood. He was a boy living with Britishers. Birsa’s early years were spent with his parents at Chalkad. His early life could not have been very different from that of an average Munda child. Folklore refers to his rolling and playing in sand and dust with his friends, and his growing up strong and handsome in looks; he grazed sheep in the forest of Bohonda. When he grew up, he shared an interest in playing the flute, in which he became adept, and so movingly did he play that all living beings came out to listen to him. He went round with the tuila, the one-stringed instrument made from the pumpkin, in the hand and the flute strung to his waist. Exciting moments of his childhood were spent on the akhara (the village dancing ground). One of his ideal contemporaries and who went out with him, however, heard him speak of strange things. Driven by poverty Birsa was taken to Ayubhatu, his maternal uncle’s village. Komta Munda, his eldest brother, who was ten years of age, went to Kundi Bartoli, entered the service of a Munda, married and lived there for eight years, and then joined his father and younger brother at Chalkad. At Ayubhatu Birsa lived for two years. He went to school at Salga, run by one Jaipal Nag. He accompanied his mother’s younger sister, Joni, who was fond of him, when she was married, to Khatanga, her new home. He came in contact with a pracharak who visited a few families in the village which had been converted to Christianity and attacked the old Munda order. He remained so preoccupied with himself or his studies that he left the sheep and goat in his charge to graze in the fields covered with crops to the dismay of their owners. He was found no good for the job and was beaten by the owner of field. He left the village and went to his brother at Kundi Bartoli, and stayed with him for some time. From there he probably went to the German mission at Burju where he passed the lower primary examination.He also studied at Chaibasa at Gossner Evangelical Lutheran Mission school run by German missionaries. It was here where he was transformed into a fighter for tribals. A Father at the school was narrating the children about the Kingdom of Heaven. The young Daud Purty(baptised name of Birsa) questioned the Father where was this Kingdom of Heaven when there was so much exploitation of tribals by zamindars and landlords in their own homeland. Birsa’s long stay at Chaibasa from 1886 to 1890 constituted a formative period of his life. The influence of Christianity shaped his own religion. This period was marked by the German and Roman Catholic Christian agitation. Chiabasa was not far for the centre of the Sardars’ activities influenced Sugana Munda in withdrawing his son from the school. The sardars agitation in which Birsa was thus caught up put the stamp of its anti-missionary and anti-Government character on his mind. Soon after leaving Chaibasa in 1890 Birsa and his family gave up their membership of the German mission in line with the Sardar’s movement against it. He left Corbera in the wake of the mounting Sardar agitation. He participated in the agitation stemming form popular disaffection at the restrictions imposed upon the traditional rights of the Mundas in the protected forest, under the leadership of Gidiun of Piring in the Porhat area. During 1893-4 all waste lands in villages, the ownership of which was vested in the Government, were constituted into protected forests under the Indian Forest Act VII of 1882. In Singhbhum as in Palamau and Manbhum the forest settlement operations were launched and measures were taken to determine the rights of the forest-dwelling communities. Villages in forests were marked off in blocks of convenient size consisting not only of village sites but also cultivable and waste lands sufficient of the needs of villages. During the period he had a spell of experience typical of a young man of his age and looks. While on a sojourn in the neighbourhood of village Sankara in Singhbhum, he found suitable companion, presented her parents with jewels and explained to her his idea of marriage. Later, on his return form jail he did not find her faithful to him and left her. Another woman who served him at Chalkad was the sister of Mathias Munda. On his release form prison, the daughter of Mathura Muda of Koensar who was kept by Kali Munda, and the wife of Jaga Munda of Jiuri insisted on becoming wives of Birsa. He rebuked them and referred the wife of Jaga Munda to her husband. Another rather well-known woman who stayed with Birsa was Sali of Burudih. Birsa stressed monogamy at a later stage in his life. Birsa rose form the lowest ranks of the peasants, the ryots, who unlike their namesakes elsewhere enjoyed far fewer rights in the Mundari khuntkatti system, while all privileges were monopolized by the members of the founding lineage the ryots were no better than crop-sharers. Birsa’s own experience as a young boy, driven from place to place in search of employment, given him an insight into the agrarian question and forest matters; he was no passive spectator but an active participant in the movement going on in the neighbourhood. Birsa’s claim to be a messenger of God and the founder of a new religion sounded preposterous to the mission. There were also within his sect converts from Christianity, mostly Sardars. His simple system of offering was directed against the church which levied a tax. And the concept of one God appealed to his people who found his religion and economical relig healer, a miracle-worker, and a preacher spread, out of all proportion to the facts. The Mundas, Oraons, and Kharias flocked to Chalkad to see the new prophet and to be cured of their ills. Both the Oraon and Munda population up to Barwari and Chechari in Palamau became convinced Birsaities. Contemporary and later folk songs commemorate the tremendous impact of Birsa on his people, their joy and expectations at his advent. The name of Dharti Aba was on everybody’s lips. A folk songs in Sadani showed that the first impact cut across the lines of caste Hindus and Muslims also flocked to the new Sun of religion. All roads led to Chalked. The British colonial system intensified the transformation of the tribal agrarian system into feudal state. As the tribals with their primitive technology could not generate a surplus, non-tribal peasantry were invited by the chiefs in Chhotanagpur to settle on and cultivate the land. This led to the alienation of the lands held by the tribals. The new class of Thikadars were of a more rapacious kind and eager to make most of their possessions. In 1856 the number of the Jagirdars stood at about 600, and they held from a village to 150 villages. By 1874, the authority of the old Munda or Oraon chiefs had been almost entirely effaced by that of the farmers, introduced by the superior landlord. In some villages the aborigines had completely lost their proprietary rights, and had been reduced to the position of farm labourers. 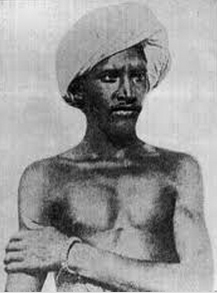 To the twin challenges of agrarian breakdown and culture change, Birsa along with the Munda responded through a series of revolts and uprisings under his leadership. The movement sought to assert rights of the Mundas as the real proprietors of the soil, and the expulsion of middlemen and the British. He was treacherously caught on 3 February 1900 and died in mysterious conditions on 9 June 1900 in Ranchi Jail.Though he lived for a very short span of 25 years,he aroused the mind-set of the tribals and mobilised them in a small town of Chhotanagpur and was a terror to the British rulers. His birth anniversary which falls on 15 November, is still celebrated by tribal people in as far as Mysore and Kodagu districts in Karnataka, and official function takes place at his Samadhi Sthal, at Kokar Ranchi, the capital of Jharkhand. Ramon Magsaysay Award winner, writer-activist Mahasweta Devi’s historical fiction, “Aranyer Adhikar” (Right to the Forest, 1977), a novel for which she won the Sahitya Akademi Award for Bengali in 1979, is based on his life and the Munda Rebellion against the British Raj in the late 19th century; she later wrote an abridged version Birsa Munda, specifically for young readers. ^ [http://www.indianpost.com/viewstamp.php/Alpha/B/BIRSA%20MUNDA Birsa Mumda commemorative postage stamp and biograph India Post, 15 November 1988. ^ Tribals celebrate Birsa Munda birth anniversary Times of India, 18 November 2001. ^ Homage to Bhawan Birsa Munda on his Birth Anniversary at Ranchi Raj Bhavan (Jharkhand) Official website. 15 November 2008. ^ Film “Gandhi Se Pehle Gandhi “is on Birsa Munda bollywood-buzz.com. ^ Biography for Mahasweta Devi " Ramon Magsaysay Award Official website. " The Dust-storm and the Hanging Mist: A Study of Birsa Munda and His Movement in Chhotanagpur, 1874-1901, by Suresh Singh. Published by Firma K. L. Mukhopadhyay, 1966. Birsa Munda and His Movement 1874-1901: A Study of a Millenarian Movement in Chotanagpur, by Kumar Suresh Singh. Published by Oxford University Press, 1983. Birsa Munda, by A. H. Khan. Publications Division, Ministry of Information and Broadcasting, Govt. of India. Birsa Munda – The Great Hero of the Tribals at Govt. of Orissa website. ^ Birsa Munda, Biography Publications Division, Ministry of Information and Broadcasting, Govt. of India.